Why am I feeling so anxious about everything? Many people have this thought once in a while. Anxiety is a protective phenomenon fitted in the brains of people by nature. Yes buoyant individuals without any anxiety whatsoever about anything rarely can perform well in life. This statement can be a great reliever for neurotic people feeling anxious about anxiety per say! Hypochondriacal people always have heightened susceptibility to stimuli that lead to excess anxiety and worry about the apparently casual situations. In such cases, anxiety becomes morbid at times and out of proportion to the external circumstances. Also it may last long after the threatening situation is gone. This kind of anxiety needs intervention and good psychological counseling. There are many types of anxiety; however, mainly we can classify it into Phobic Anxiety (phobia) and Panic Disorder. An abnormal fear brought on by a particular object or situation because of which the person avoids that stimulus is termed as phobia. Phobias are commoner in women and genetic contribution is important to consider. Scientists have attributed these types of phobic anxieties to some traumatic event on the childhood of the patient. This boosts the homeopathic physician�s concept of seeking detailed childhood history of the patient, in which lies the answer to his or her anxiety in adulthood. Panic disorder is sudden onset of unpredictable and severe anxiety. They usually are not related to a specific situation and they are linked with depressive disorder. In this variety, the physical symptoms like palpitations, chest pains etc are prominent. The patient fears that he is about to die. Choice of treatment goes a long way in establishing the normal homeostasis in the emotional sphere of patient�s life. Many people deny that anxiety needs to be treated. But it is evident that without treatment, sulking, brooding, irritability, and excessive worry do not lessen but aggravate to take graver form. Therefore, management of anxiety is a very important step towards the person�s brighter future. Psychological counseling is the most important pillar of anxiety treatment. An expert psychologist can reassure the patient and can inculcate in him the confidence that he can get better. As homeopathy deals with mind effectively, a homeopath himself is a great psychologist. Seeking apt data from the patient is an art and only that homeopath succeeds in treating the patient, who has in-depth understanding of the patient�s psyche. 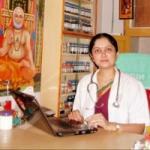 Therefore we can say that psychological counseling and homeopathic case taking and analysis go hand in hand. They cannot be separated. Even for psychosomatic anxiety, importance of counseling cannot be underestimated. Specific relaxation techniques help a great deal in patients of anxiety. Specific Yoga techniques, Pranayam, and homeopathy together can work marvelously well in these patients. Anxiety is a disorder in which conventionalists have very limited role. If you do not want to fall prey to heavy doses of anti-depressants that may leave you dizzy all day long, seek an expert counselor homeopath that can help you find the best equilibrium in your physical, mental, and emotional realms. Talking to a homeopath is a great way to find the best emotional catharsis for sure!